There are many ways to give charity — donating to build mosques or supporting education — but meeting medical needs are extremely valuable for the community. Keeping this in mind, Abdulkarim Bakr set up a nonprofit medical clinic for renal dialysis to serve the community. The budget of SR25 million for the construction of the center and all medical equipment was provided by the Bakr family. The clinic is working under the supervision of Al-Bir Charitable Society and the board members are dignitaries and medical experts from various sectors. Dr. Tawfik M.N. 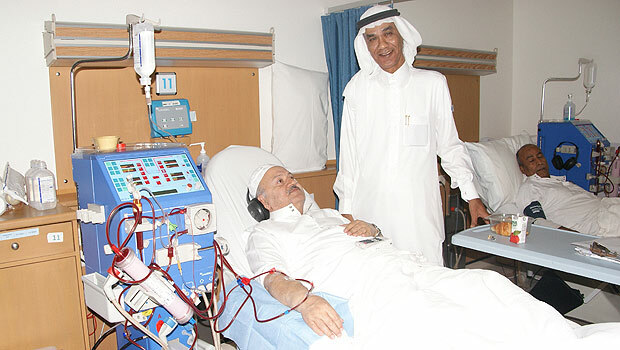 Rahaimy, CEO and executive director of the medical center, said there is a shortage of dialysis centers in Jeddah and in the Kingdom, “The center is providing services to the community without any discrimination, as the doors of the clinic are open for patients of all nationalities. To cover the expenses, Jeddah’s generous people are helping us through donations, and the Bakr family is also looking after the expenses,” said Rahaimy. The center has three floors and a basement. The first floor is equipped with the dialysis machines, on the second floor is the diabetic clinic, and the third floor is reserved for independent clinics, whereas the basement has a water process unit, medical equipment and supplies, and a generator backup. There is a double water treatment plant to make sure the water for the dialysis process is clean and up to the standard. A computer network monitors the patient's condition during dialysis, and there is medical equipment to support and keep the patient’s data. It also has a fully equipped ambulance to use in emergency cases, a laundry to generate the standard of hygiene, and the best services provided by experienced and certified staff. “We have every single equipment in our clinic we need to facilitate the patients. There are 14 nurses, two doctors and some administration staff,” said Rahaimy. He further said that the international standard was maintained in the clinic. The clinic has two shifts, from 7:30 a.m. to 12:30 p.m. and from 1:30 p.m. to 5:30 p.m. During each shift, 21 dialysis units operate serving 42 patients each day, and 84 patients every week. The number of patients with renal failure in the Kingdom is rising gradually, and according to recent statistics, the number now exceeds 8,000, which is quite alarming. “We are open to all hospitals and institutes, but it depends on whether we have space or not, because at the moment we also have a waiting list of patients. We are planning to start a third shift in the future, as the demand is very high,” Rahaimy explained. “That’s why we emphasized that wealthy and healthy people of the community should come forward to help out,” he said. The center is providing services to two kinds of patients: those who cannot pay themselves and need the help of sponsors, and others who can pay. People who cannot pay can contact Al-Bir Charitable Society, and with their approval, the center accepts patients for treatment. People who are covered through medical insurance or sponsored by someone can also get treatment at the center. “Even from the people who pay, we are taking minimum fees for all the services we provide. Blood investigation is done by the center after every three and six months to check the patient’s condition, so we can give him or her the best treatment,” said the CEO, adding that the Bakr family was also working hard to keep the quality and improve the services. Rahaimy also said the government was striving to equip hospitals to provide treatment to patients with renal failure. “This is a huge project, as in Western countries these kind of services are usually provided by the government. However, the government cannot do everything; we have to accept this, so it is the duty of the citizens to come forward and help fellow citizens in distress. Although many people and companies are helping, we don’t have proper coordination in the sense that such support should be extended on a priority basis,” he said. He emphasized the importance of cooperation from the private sector as part of their social responsibility to solve and cover the needs. The number of patients with kidney problems is increasing year after year. The center is treating more than 13,000 to 14,000 patients at the moment, but still more beds are needed for kidney dialysis. He further said that the center was getting support only from the community, but that it was crucial such centers get assistance from the government sector as well. Kidney disease is also a symptom of other diseases that may affect any organ in the body at any time, and there are many causes for kidney failure, such as diabetes and hypertension. “Specialists speak a lot about this disease and methods of prevention, but it is sad there is no awareness among citizens, and people don’t take an interest in maintaining their health. If people did take care, they could save themselves from this problem. There are other reasons as well, but maintaining health is a major factor. I hope people can understand the importance of caring for their health and bodies,” he advised. Rahaimy said he wanted to make sure that the funds and financial support from the community were guaranteed. He also said they hoped that in the future, they could open centers for treatment of renal failure in other cities as well as places where no treatment facilities are available. The patients are highly satisfied with the treatment and attitude of the staff. Arab News talked to Abubaker Ali Mohammed, an Ethiopian who has been getting treatment for the past year. He said he was highly satisfied with the center’s treatment and attitude of the staff. “I think this is the best treatment center in Jeddah. The employees are very nice and friendly, and the best thing is that they provide the services to all patients without any discrimination. From time to time, their services are becoming better,” said Mohammed Sayed Bawazir, a Saudi patient. Doris Newels, the head nurse of the center, said that the process of getting admission at the center is the same for patients who can pay and those who can’t. “We cater to different nationalities for treatment of chronic cases. We don’t accept hepatitis B patients, but we accept hepatitis C patients in a limited number. I believe we are one of the best,” she said.